When you think about brands of dog food, Dog Chow is probably one of the first names that comes to mind. Dog Chow may be affordable and it is certainly easy to find, but it is not one of the better pet food brands on the market. Dog Chow products are made with a variety of low-quality fillers like corn, wheat, and soy ingredients – many of their products also contain artificial additives. While Dog Chow does offer a natural line of products and some of their foods are free from artificial additives, the brand as a whole is not at the top of the list when it comes to quality pet food brands for your dog. The Dog Chow brand of dog food is a member of the Purina family. Though the Purina company has been around for many years, the Dog Chow brand was started in 1957. It only took two years after its release for Dog Chow to become one of the leading dog food brands sold in the United States. Purina pet food brands are currently produced and manufactured by the Nestle Purina PetCare Company. Originally known as the Ralston Purina Company, Purina was acquired by Nestle in 2001 and was then merged with the Friskies PetCare Company soon after. Today, the Nestle Purina PetCare Company is headquartered in St. Louis, Missouri. It is the second-largest pet food manufacturer in the world and the largest in the United States. Is Dog Chow Made in the United States? The Nestle Purina PetCare Company is the second-largest manufacturer of pet food products worldwide, having operations in North America, Europe, Asia, Africa, and Latin America. Though the Purina brand of pet foods is available all over the world, the Purina website states that 99% of their products are made in the United States. Neither the Purina website nor the Dog Chow website state whether this is true of Dog Chow and Puppy Chow products. Where Does Dog Chow Get Their Ingredients? The Dog Chow website provides very little information about their products. Not only do they fail to note where Dog Chow and Puppy Chow products are made, but they also don’t provide any information about where they get their ingredients. In fact, the Dog Chow website doesn’t even show the full ingredients list for their products unless you click on the link in the fine print. When you click on a particular recipe, you only see a description of the product and a list of the top six ingredients. In March 2016, Purina issued a voluntary recall for various Pro Plan Savory Meals and Beneful products due to inadequate vitamins and minerals. In August 2013, the FDA issued a recall for Purina ONE Beyond Our White Meat Chicken & Whole Barley Recipe Adult Dry Dog food due to potential salmonella contamination. In May 2012, the FDA issued a recall for Purina Veterinary Diets OM Overweight Management canned cat food due to possible low thiamine levels. In July 2011, Purina issued a voluntary recall for Purina ONE Vibrant Maturity 7+ dry cat food due to potential salmonella contamination. In June 2011, Purina issued a voluntary recall for Purina Cat Chow Naturals due to potential salmonella contamination. Dog Chow and Puppy Chow products can be found in most major pet food chains as well as big box stores and some grocery stores – you can also purchase Dog Chow products from various online pet food retailers. Dog Chow offers coupons on the company website and you may also be able to find Dog Chow and Puppy Chow dog food coupons from individual retailers. How expensive is Dog Chow? The Dog Chow brand of dog food is very inexpensive when compared to other pet food manufacturers. While a low price might seem like a good thing, lower prices for pet food are usually correlated with lower quality ingredients. Before you buy Dog Chow or Puppy Chow for your dog, consider whether you can afford something a little bit better. The price for a 32-pound bag of Puppy Chow dry dog food ranges from about $28 to $53, depending on the recipe. A 32-pound bag of dry Dog Chow costs $22 to $50. The Dog Chow brand currently doesn’t offer any wet food options. What Kind of Dog Food Does Dog Chow Offer? The Dog Chow brand of dog food offers a wide variety of product choices for adult dogs, puppies, and senior dogs. There are a number of recipes formulated for dogs of certain life stages and breed sizes, as well as recipes for picky eaters. AT this time, Dog Chow does not offer any wet food or canned food products – they only offer dry foods. What many people love about the Dog Chow brand is that it is affordable and you can buy it just about anywhere. If you take just a few minutes to review the information on Dog Chow product labels, however, you may rethink your opinion of this brand. 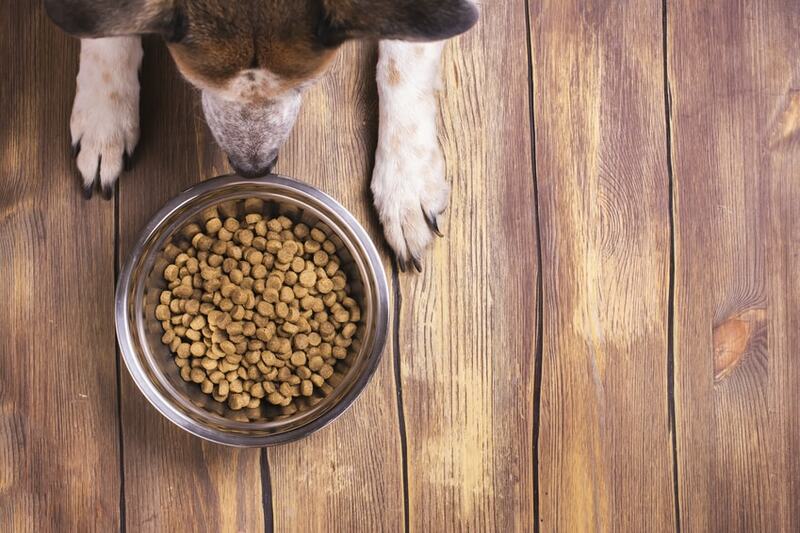 Many Dog Chow products list low-quality fillers like whole grain corn as the first ingredient and there are few mentions of high-quality proteins. Dog Chow products may meet your dog’s minimum nutritional requirements, but not through the use of quality ingredients – this brand uses a lot of synthetic supplements to balance out the nutrition lost during the high-heat extrusion process. This Dog Chow Adult Complete Nutrition Dry Food recipe is described as a “highly digestible recipe made with high-quality protein”. It is said to provide complete and balanced nutrition for adult dogs, helping them to live long and healthy lives. In the website description for this product, it says that this recipe is crafted in the USA which is a good thing, but a quick review of the ingredients list reveals that this is not a high-quality recipe for dogs of any age or life stage. Though this recipe does meet your dog’s minimum nutritional requirements, it is largely through the use of synthetic supplements, not quality ingredients. The first ingredient in this Dog Chow Adult Complete Nutrition Dry Food recipe is whole grain corn. While some whole grains are considered high-quality, digestible ingredients for dogs, corn is not one of them. Not only is corn one of the most common food allergens for dogs, but it is also very hard to digest and offers little nutritional value. Additionally, it is always troubling when a plant-based ingredient is listed first in front of any kind of protein. This is not the only non-nutritive ingredient included in this recipe either – there is also corn gluten meal, soybean meal, and whole-grain wheat. Do not let the words “whole grain” fool you – corn, wheat, and soy ingredients are never good for dogs. Not only does this Dog Chow Adult Complete Nutrition Dry Food recipe list whole grain corn as the first ingredient, but the main source of protein comes from an unnamed source – meat and bone meal. Meat meals can be beneficial ingredients because they are a highly concentrated source of protein. When the meat meal comes from an unnamed source (like meat instead of chicken), however, it is difficult to judge the quality. This recipe doesn’t contain any quality, named proteins at all. The only other proteins listed are chicken by-product meal and corn gluten meal. Even though corn gluten meal is a grain-based ingredient, it contains a high percentage of protein. Keep in mind, however, that plant proteins are less biologically valuable for dogs than animal proteins and they don’t contain all of the essential amino acids your dog needs. The remaining ingredients in this Dog Chow Adult Complete Nutrition Dry Food recipe consist primarily of fats, flavors, colors, preservatives, and supplements. The main source of fat in this recipe is animal fat – another unnamed ingredient that may be of questionable quality. There are multiple artificial colors and flavors listed such as egg and chicken flavor, yellow 6, yellow 5, red 40, and blue 2. This recipe relies heavily on synthetic supplements to ensure nutritional balance as well – this is because a significant portion of the natural nutrient content for the raw ingredients is lost during the high-heat extrusion process. Synthetic supplements offer limited nutritional value for dogs because your dog’s body can’t absorb and utilize all of the supplement – natural sources for vitamins and minerals are much more biologically valuable. This Dog Chow Adult Complete Nutrition Dry Food is formulated to meet the nutritional levels established by the AAFCO Dog Food Nutrient Profiles for maintenance of adult dogs. Overall, this Dog Chow Adult Complete Nutrition Dry Food recipe receives the lowest rating of 1 out of 5 stars because it doesn’t contain any high-quality ingredients whatsoever. Not only does this recipe start with a known allergen and low-quality filler, but none of the proteins come from named animal sources – in fact, most of the protein is plant protein. This recipe may meet your dog’s basic nutritional needs, but it is not through the use of any quality ingredients. Most of the nutrients come from synthetic supplements so your dog won’t even be able to absorb or utilize most of them. All in all, there is no good reason to feed your dog this Dog Chow Adult Complete Nutrition Dry Food recipe. This Puppy Chow Complete Dry Food recipe is marketed as a recipe designed specifically for puppies but it is actually nutritionally complete for dogs in all life stages. This is a little bit strange, considering the fact that the description for this recipe states that, “puppies have unique needs”. The description goes on to say that this formula starts with a healthy blend of high-quality proteins as well as all of the ingredients puppies need to set the foundation for a healthy and active life. All it takes is a quick review of the ingredients list, however, to reveal that this recipe is not a healthy foundation for any dog. The first two ingredients on the list for this Puppy Chow Complete Dry Food recipe are whole grain corn and corn gluten meal. This is problematic for multiple reasons. For one thing, corn is a known food allergen for many dogs and it is also very difficult to digest. Furthermore, corn products offer very limited nutritional value for dogs. Whole grain corn is a carbohydrate that is included to provide a source of energy but corn gluten meal is used as a type of protein. The problem with corn gluten meal as a protein source is that it is plant-based – this means that it is difficult for your dog to digest and it doesn’t contain all of the essential amino acids he needs. The only animal proteins used in this recipe is chicken by-product meal. The remaining ingredients in this Puppy Chow Complete Dry Food recipe consist primarily of fats, artificial flavors, colors, and synthetic supplements. The main source of fat in this product is animal fat. While animal-based fats are more biologically valuable for dogs than plant-based fats, named sources are always better than generic sources – even the fish oil comes from an unnamed source. This recipe includes several artificial colors and flavors like egg and chicken flavors, yellow 6, red 40, and blue 2. The synthetic supplements used in this recipe are necessary because much of the original nutritional content of the raw ingredients is lost during high-heat extrusion. Unfortunately, dogs are only able to absorb and utilize a fraction of the nutrient content for synthetic supplements – natural sources for vitamins and minerals are always better. This Puppy Chow Complete Dry Food is formulated to meet the nutritional levels established by the AAFCO Dog Food Nutrient Profiles for all life stages. Overall, this Puppy Chow Complete Dry Food recipe has very few things going for it. Not only does it start with a known allergen and low-quality filler ingredient, but the only animal source of protein comes from a by-product. This recipe is loaded with artificial flavors and colors, plus the synthetic supplements that your dog won’t even be able to take full advantage of. All in all, this recipe contains too many low-quality and non-nutritive ingredients to be given anything higher than a 1 out of 5 star rating. Your dog deserves a product that is much better than what this Puppy Chow Complete Dry Food recipe has to offer. I use Purina One for mature 7+ chicken for my dog. Are there any recalls on this brand? My dog is 10 yrs old and I don’t want her to get sick! I also buy Purina One Smart blend canned meat to mix with her food. Any recalls on that?